What is the difference between Main Boards, Shareable Boards and Private Boards? – Hey. Ask us anything! We have 3 types of boards: Main, Shareable, and Private. Each of these boards' structure is the same. What makes them different is their access level. 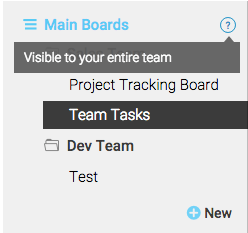 Main boards are visible to anyone who is a team member within your account. A team member can be an admin, a member or a viewer. To learn more about the difference between each type, check out this article. Anything you will create in this section will be accessible and transparent to your team members. These boards are available on all our plans and there is no limitation to the number of boards you can create. Shareable boards are used when you want to share a board with people outside your team or company, such as clients, interns, or freelancers. You can invite these people as guests within your account. To see how to invite a guest in your shareable board, click right here. When you invite a guest to a shareable board, he/she will only have access to that specific board he/she has been invited to. Your guests will not have access to any other information within your account. To see what an external guest is able to do on a shareable board, please see What do my guests see and do on my shareable board? You can also invite your team members to your shareable board whether they are viewers or members. Your team members will only be able to see the shareable boards they have been invited to. Shareable boards are available on the Standard, Pro and Enterprise plans. Private boards can only been seen by the person who created the board and by the specific users he/she invite to join this board. The private boards are only for internal user meaning that you cannot invite guests on a private board. Only team members (viewers, members) can be invited to a private board. The private boards are found on the Pro and Enterprise plans. If you have a project you aren’t quite ready to release or confidential information, private boards is the solution for you! How can I regain access to the shareable/private boards I made in my trial? You can click on the Board Name and then click on the button "Move to Main Boards" or you can click on the Board Name and drag it to the Main Board or Shareable Board section.